I woke up in my own bed in my flat in Norwich. This was not a false awakening - it was perhaps a dream-within-a-dream, although I cannot say for sure. I got out of bed. The light in my room was on. The room was largely similar to how it should be in real life, with some differences - there was a large map of the wall above my desk and the small cupboards next to my desk were not there, just wall space. I was aware someone was trying to enter my ground-floor flat by the window (climbing through onto my desk). This did not worry me as much as it should. I stood beside the desk and opened the curtains, to see that it was one of the University Security Officers (DD1), an older white man. He said to me: 'This is a drug's bust!' I was not worried. 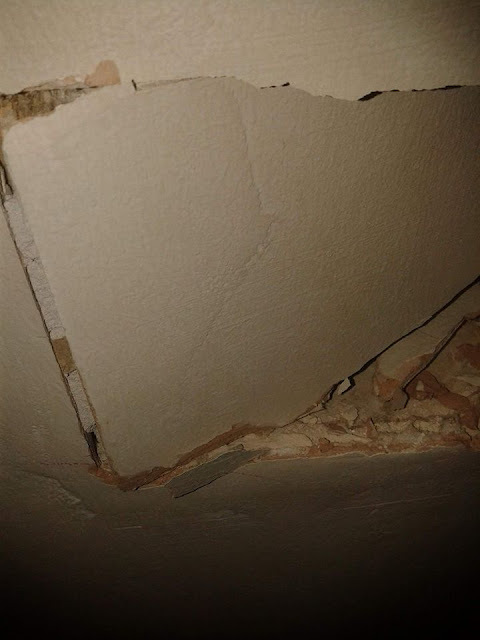 I then saw a hole in my wall beside the desk, with a bare foot coming through, as if the hole had been kicked in. I was aware that on the other side of this wall was my housemate SC's room (in real life, his room is on the other side of the wall against which my bed is). I poked the foot, thinking it was SC's - and hoping that this would make him stop putting it through to my side of the wall. From the other side of the wall SC told me that the foot belonged to his girlfriend, ML. I saw that it was a small female foot and I apologised. I was then in my bathroom with SC - it was day because there was a small window above the toilet (which is not there in real life and would not be possible as this wall is joined to the kitchen of the flat next door, not an exterior wall). We were discussing the need to purchase more toilet paper. SC told me that 'an extra roll had been left' because 'DT (our boss) knew I would be staying for an extra day'. In the dream this made sense to me. This dream was not related to my Dream Incubation Experiment - it seems to be drea fragments based solely on Day Residue and actual real life experiences.